on opposite banks of river dividing the kingdom of Benares lay two villages. Their unter c fast friends throughout the years, betrothed their infant children to each other shortly after their birth Now, these two were not like other children; they were born with skins of golden hue. And although they were surrounded by hunters, they refused to ham any living creature. In vain each begged his parents to forgot the nuptails. Against their will they were married but secretly determined to live as brother and sister. Dukula, as the boy was called, and Parika, the girl, unwilling to hunt or partake of the comforts of their parents' dwelling, were allowed to go into the forest and live in a hermitage where they led lives of meditation and purity. Although Sakka helped them 3si with their small needs, he was uneasy, for he knew that their past had not yet been washed clean. Sakka foresaw that a grave misfortune was to strike them. He tried to convince them that they would have to bear a son in order to be assured of someone to care for them. "Never," they said, "Impossible." for this was not the way of asceticism. At last Sakka persuaded them that a pure conception take place i at the proper time, Dukula placed one finger on his wife's naval. So it was that the Bodhisatta was reborn into the world of men. Budhisatta was named Suv or Sama. When sama was sixteen, as predicted, a misfortune befell his parents. As they were making their way home after a day of gathering fruits it suddenly began to rain. Taking shelter at the roots of a tree, they unwittingly stood on an anthill under which a poisonous snake resided As they huddled there, drops of their sweat fell onto the snake and he was angered. So he puffed out his deadly breath at them and blinded them instantly. From this time onward their son was their sole support. Sama tied ropes and bamboo poles in all directions for them to follow. He swept their dwelling clean of leaves and insects, collected their food, fed them succulent fruits. One evening, while Sama was fetching the evening's water in his small round pot, which one of the deer that accompanied him used to carry for him, the king of Benares wandered into the forest, While hunting for venison, he had chanced upon a glade near the pond where Sama stood. The king shot a poisoned arrow into Sana's side. The de fled in terror. And sama slowly and gravely sank to the sand. Blood poured from his lips as he spoke aloud, asking who it could be who desired his death and what could be gained by such an act. 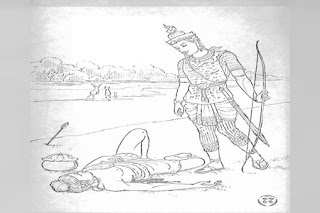 King Piliyakka was stuck by the absence of blame or anger in Sama's words. Still the boy did not reprimand him. Instead, he grieved aloud for his parents. Who would feed them now? Who would bring them water each days? Who would bathe them? 30 The king was struck with shame. Where upon he took up the water pot and promised sama to care for his parents as if they were his own, Same them Goon lost consciousness. Piliyakka, thinking he was dead waild loudly and paid homage to Sama's body. In the meantime a daughter of the gods who had been Sanaa's mother in his seventh incarnation before this one sensed that something had be fallen her former son.. Convinced that Sama as wall as his parents would die if she did not intercede, she spoke G8mic gout to the king, "O king," You have done a grievous thing, Go and nurse the blind parents and your bad deed shall be forgotten and you will attain heaven. Inspired by goddess's words. Piliyakka se the out for the hermitage. There he comfessed his crime to Sanaa's parents. They were stricken with so and grief. They asked merely that the king lead them to their son's body. The king reluctantly complied On reaching their son, the two ascetics kenlt down and wept All past evils having been washed away by their tears, they were able to bring their son back to life. As his mothers solemn words, he turned to herself and profoundly asserted the virtue of Sama. At last Sama stirred, then rose, fully recovered from his injury. At that very moment, dawn broke over the forest and Sama's mother and father could see with their own eyes Sama's restoration.